My very first job, at 16 years old, was at See’s Candies in Portland, Oregon at the Lloyd Center Mall. 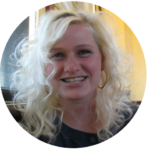 I loved it so much I transferred to the store in Orem, Utah during college, and when Gabriel and I were married came back to my job at Lloyd Center. Eating bon bons all day? That’s the life. Especially, when I could eat bon bons while Gabriel was working just two stores down from me. He was hired to work in the women’s shoes department at Nordstrom. We spent years holding these two jobs, living across the street in a studio apartment. We’d walk into work together, him in a fancy pressed suit and I in a white old fashioned nurse’s uniform with white matching Dansko’s, that he sold me no less, and we’d meet up for lunch or dinner, and then walk back across the street home. Years later, having learned from my Grandmother how to make chocolates of my own, I set to task one Christmas of perfecting her famous Southern Pecan Logs. I took her recipe and expanded it. I created traditional Pecan Logs, Chocolate Pecan Logs, Lemon, Peppermint, Pumpkin and more! I even sold them for a short while before the twins came along! It became a type of homework to seek out other chocolates and baked goods. We would stop every time we would find a new patisserie or chocolatier to get inspiration, new ideas, or just compare. I’d always dreamed of owning a little pink food truck, Fahrenheit 350° emblazoned across the side, filling it up for the morning and driving home when the shelves were empty. You could say I know a thing or two about candy. 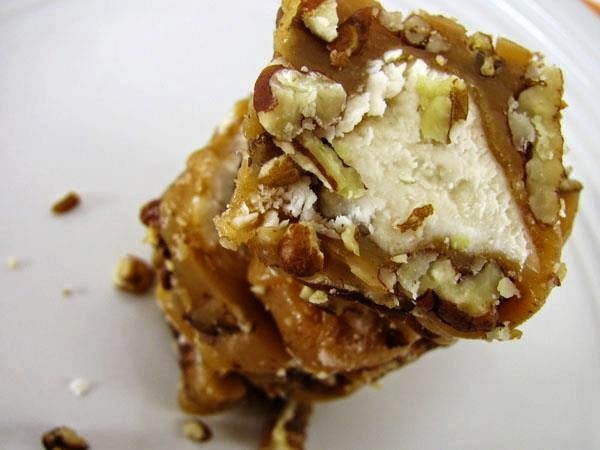 But living on the other side of the continent, we’d never heard of Harbor Sweets until we started looking up activities in Salem, Massachusetts. 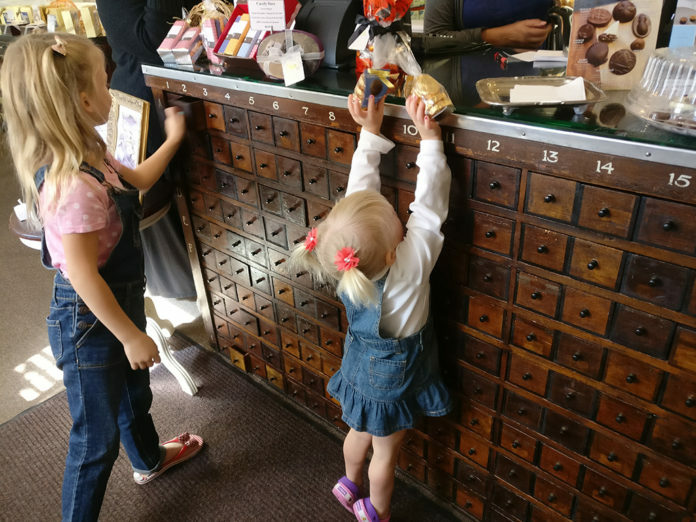 When we discovered they held factory tours on the day we planned to be there, we knew it would be the perfect way to kick off birthday celebrations for our three year old Eclair. The city of Salem is fairly small, and easily walkable. We took the commuter train in from Boston, and walked through the city to Harbor Sweets. The brick building is immediately recognizable with a red banner hanging on the side of the building indicating you’ve arrived! 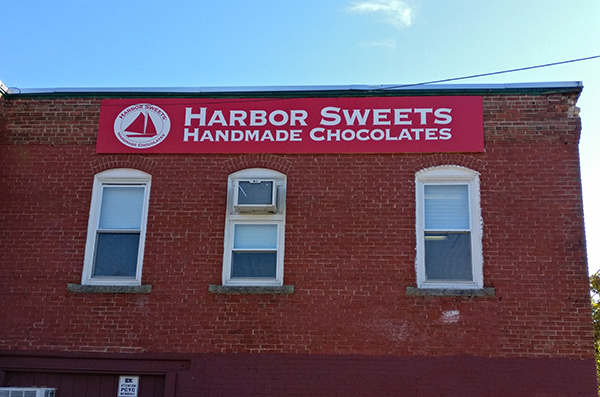 This location is not only the factory where every single sweet treat that is crafted by Harbor Sweets is made, but it’s also a storefront where the treats are sold as fresh as they come. Items can be purchased elsewhere all over the northeast, and ordered online. After being greeted with a sample of the chocolates, the factory tour starts with a brief introductory video into how Harbor Sweets was founded by Ben Strohecker. He began, like most us, making confections in his home back in the 1970’s. Wanting to expand and share his chocolate confections with everyone, he increased production and made his signature treat, the sweet sloop. This is a triangular toffee covered in white chocolate with a wisp sliced down the middle to resemble a sailboat. The base of the boat is then dipped in dark chocolate and covered in crushed almonds. We even got to watch as a batch of these sweet sloops were cut and prepared for their chocolate coating! After this presentation we moved onto the floor where we watched the workers coat the fillings with chocolate and fill their molds. Their technique was effortless. We got to see the giant vats of chocolate tempering in white, dark and milk chocolate. 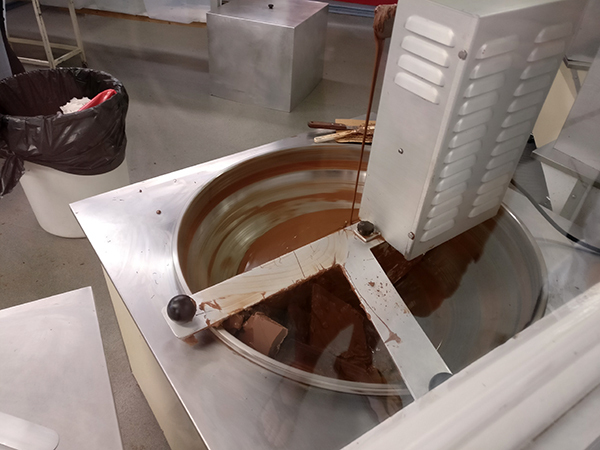 We got to see the preparation and attention to detail in creating the beautiful chocolates, and then watch as the product went into the fridge for setting up. We got to see the other side of production in the boxing up and beautiful wrapping that adorns each piece of chocolate, and each box of confections. The entire warehouse is much smaller than I imagined, but the work is streamlined with precision. It was such a neat process to visually recognize that really, they are doing the same thing I do in my kitchen every Christmas. In fact, they even use Peter’s Milk Chocolate, the same chocolate my sisters and Mom use! Personally, I prefer Callebaut. The main difference is just they have an assembly line, where at home I’m doing all the work by myself. Sometimes I get my sister’s to help, and now that the twins are getting older they love to help too! I’m excited to share our family tradition with them. 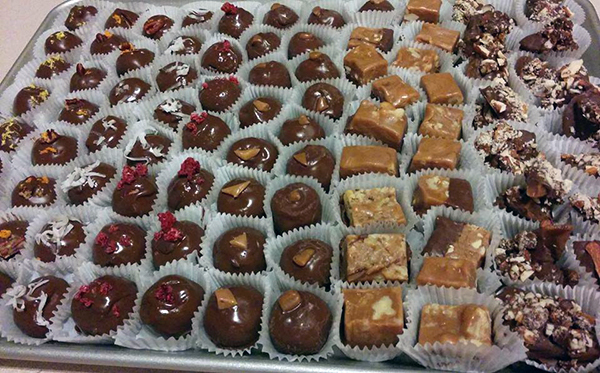 Harbor Sweets sells several different collections of chocolates. Gather, a collection devoted to saving bees which are dying around the world for unknown reasons; Salt & Ayre, chocolates fused with unique salts and spices; Dark Horse, a selection of chocolates for equine lovers pairing the natural mix of sophistication and chocolate. We came home with a box of 24 Sweet Sloops that lasted five minutes, and we didn’t share with the kids. We were very regretful that we didn’t purchase the largest box available, which was 72 pieces. 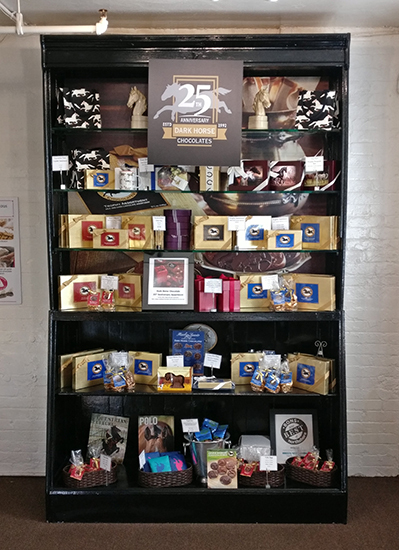 We also brought home some Peanut Butter Sea Biscuits from the Dark Horse Chocolate Collection, and the Sand Dollars from the original Harbor Sweets Chocolates – a creamy caramel with pecan, covered in dark chocolate. All of our goodies were consumed in the same day, and it was worth every gluttonous bite. 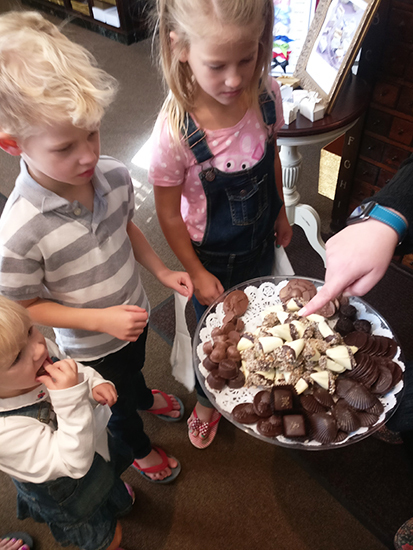 ► For Kids: The tour is short, and comes with free samples, so most little taste buds will be appeased. There isn’t a lot of room to move around, so wiggles will want to be released before coming on the tour. 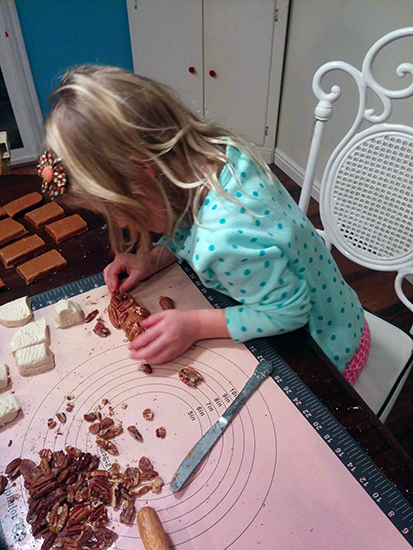 It’s really neat to see the process, and the dedication to ensuring every piece is as beautiful as it tastes. 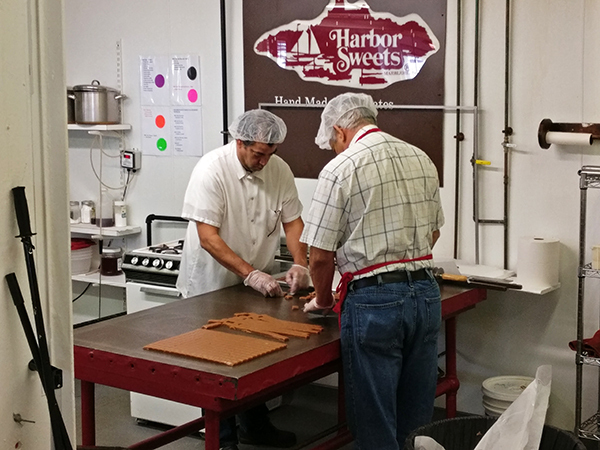 Have you toured the Harbor Sweets Factory? 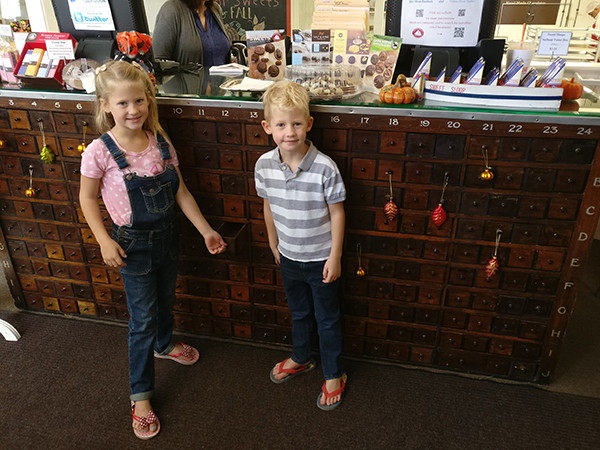 We’ve been on a few tours including the See’s Candies Factory Tour in San Francisco, and the Maison Cailler Chocolate Tour in Switzerland (coming soon)! It’s one of our favorite things to do! ► Nap-Time Version: Our day at the Harbor Sweets Candy and Chocolate Factory in Salem, Massachusetts! We had a ton of fun in Salem on our Tales and Tombstones Trolley Ride, at the Witch Dungeon Museum and eating dinner at Howling Wolf Taqueria.